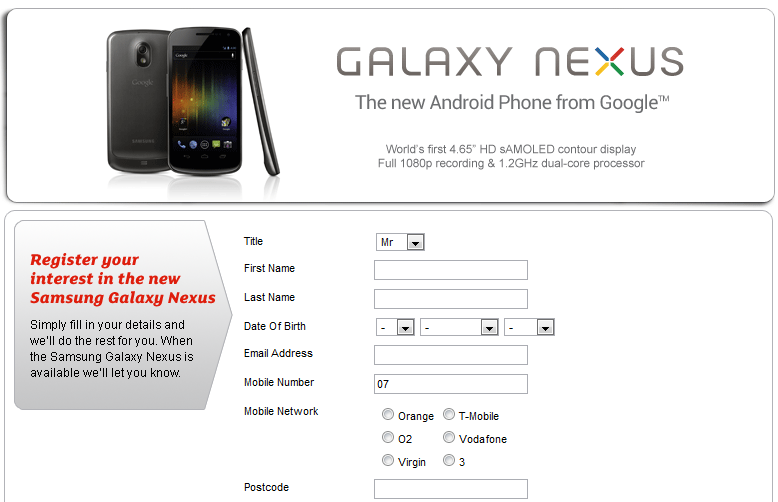 OK, if you haven’t already heard about the Galaxy Nexus (joint Samsung and Google handset) then you have been living on another planet. 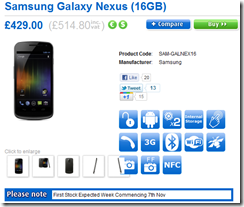 Being a UK based website we thought it best to update you all on what’s going on in the UK with this handset, who’s gonna stock it, when it will be released and the prices. Lets start with the networks then. 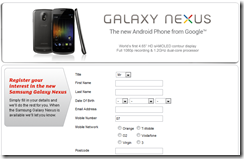 3 of the 4 Major UK networks have announce that they will have the Galaxy Nexus via Twitter earlier this morning. The fist to declare themselves in was Vodafone swiftly followed by o2 and then 3. Sadly none of the networks have given an indication to price or release dates as yet though we can assume it will be early to mid November. Orange and T-Mobile (who are the same company) have both Tweeted that they are unsure if they will stock the phone as yet. If you don’t want to go down the route of a contract then you could outright buy the handset from Clove or Expansys sim free. Now, Clove stated via their blog that the 32GB version of the handset will NOT be coming to the UK however Expansys have both versions to pre-order which has me questioning what the real answer to that question is. Outside buying sim free and direct from the networks we can also confirm that Phones4U are stocking the handset though for which network we are unsure.Their register interest page is live just now along with a nice hands on review video. So there you have it, the Galaxy Nexus is coming to the UK and very soon though for how much on a contract and when we have no idea. If you have any questions but cant be bothered digging around to find the answer then email team@landofdroid.com and we will do it for you.